The Internet is all about speed and while we've come a long way from the dark dial-up days of 33.6 kbps and 56 kbps, it could be even faster still. 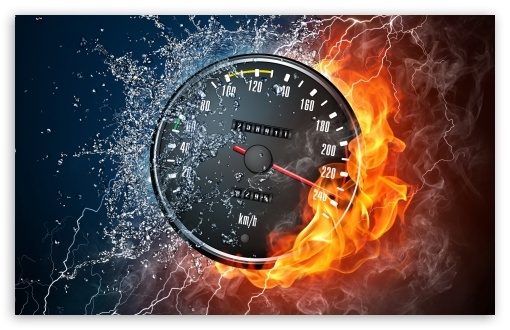 One of the most common complaints we hear is that the actual speed we get is much slower than what was subscribed for from the Internet Service Provider. Now, there could be a whole host of reasons for the slow speeds such as modem and router issues, problems with a specific website and throttling by your ISP. The first step to solving the problem is always to test your speed and find out where you stand. Before we get into the tools, there are a couple of things you need to take note of before using the speed tests. Before starting the speed test you should close all other Internet activities such as downloads, messengers (Skype, Facebook Messenger, etc. ), e-mail clients, FTP connections, P2P software such as BitTorrent. If your Internet connection is shared, try to ensure that nobody else uses the network during the speed test, as this can negatively influence the results. Also, if you're connected via WiFi (wireless) try to place yourself as close as possible to the router in order to maximize signal strength. With that said, here are 5 of the best free tools which will help you do just that! Probably the most well known Internet speed test site, Speedtest.net operates mainly over TCP testing with a HTTP fallback for maximum compatibility. Speedtest.net measures ping (latency), download speed and upload speed. It's accuracy and high quality performance relies on the thousands of servers that host Speedtest around the world. In fact, there's at least one quality testing server in almost every major city. To start, simply choose the server in the city you wish to ping and click on "Begin Test". If you're based outside the United States, we recommend pinging a server in the US, since most websites are hosted there. Unlike Speedtest.net, with Speed.io, you don't specify the server location you wish to connect to. When you click to start the test, speed.io will automatically select which servers on their network to connect to in order to perform the download, upload, ping and connects tests. Speed.io does not require any special software- only a modern browser with Flash 9 installed. The interesting thing about Speed.io is how your results are interpreted. Rather than compare your results against the average results from your country, Speed.io compares the performance of your Internet connection against what your Internet subscription package. For example: if you have a 2 Mbit/s connection and achieve 1.9 Mbit/s then it's considered to be a "very good" result. However, if you have a 25 Mbit/s connection and achieve only 12 Mbit/s, then it is "slow", because you are more than 50% under the promised speed! The evaluation doesn't indicate whether your connection is fast or not, but instead whether your speed reaches what your provider promised you. One of the great things about Bandwidth Place is that it uses HTML5 instead of Flash like speedtest.net and speed.io. A lot of phones and tablets do not support Flash. Bandwidth Place's HTML5 speed test technology allows you to test your bandwidth on any PC, laptop, phone or tablet without updating your browser, downloading a separate mobile app or installing Flash. If there's one downside of Bandwidth Place, it is that you're unable to create an account that will allow you to store and track your results. Similar to bandwidthplace above, speedof.me is an HTML5 Internet speed test. Which means that unlike other tests that use Java or Flash pugins, they don't require a lot of system overhead. It works well on an iPhone, iPad, Android, Windows 8, other mobile devices as well as desktop computers. SpeedOf.Me tests your internet connection by directly downloading and uploading sample files from your browser, thus reflecting your actual browsing and download experience. The Download Test begins by downloading the smallest sample sized file (128 KB) with the results displayed by the real-time bandwidth graph. If it takes less than eight seconds, the next download file sample will be tried. Otherwise, it will move on to the upload test instead. Of the downloaded samples only the last one which took more than eight seconds will be accepted and your download speed is based on the last sample file. Once the download test is completed, a similar incremental mechanism will be used to send data to the SpeedOf.Me test server. The upload test starts with a small sample file and will gradually increase until it takes more than 8 seconds to upload a sample file. SpeedOf.Me also downloads large contiguous sample files, similar to what you usually do, when you download a webpage or other media. Other speed test services download small chunks in parallel and do heavy adjustments to calculate your approximate speed. Another plus point for SpeedOf.Me is that it utilizes several test servers (PoPs) in various locations for the test, rather than a single test server, which makes the test result more realistic. Before you call your ISP's tech support and rant about your poor Internet speed test results, it would be wise to test your speeds on your ISP's own speed test site, if there's one. The results here would be indicative of what tech support would see when they troubleshoot, so it's good just to make sure that there's no anomaly. 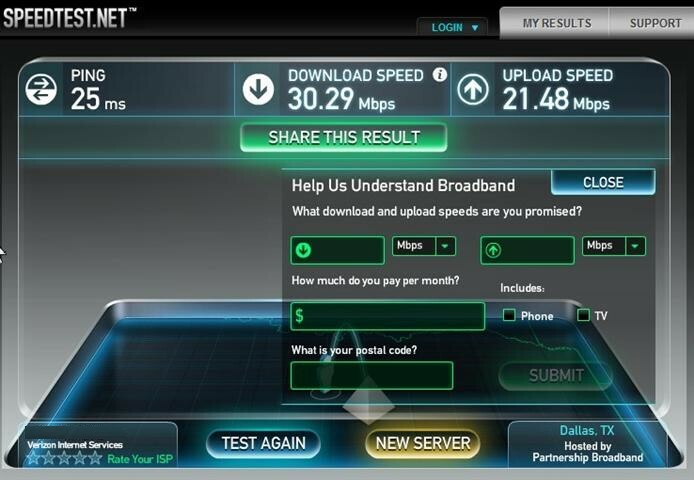 A quick check shows that Comcast, TimeWarner and Rogers all have their own speed tests. Close all other non-essential programs such as browser tabs, messengers, e-mail clients, FTP to save memory and CPU. Performance of your modem Get a modem that is able to support the number of download and upload connections with up to date DOCSIS standard (currently 3.0). For more information on which modem to get, check out our guide on the best modems of 2015. In general, the closer your device is to the router, the better the signal strength will be. Also, if you have too many devices connected over the same frequency, performance will suffer. One solution might be to get range extenders or upgrade your router to one that covers a wider area. Torrents, VOIP and IPTV are bandwidth heavy. Meaning that they require a lot of data transmission, leaving a "narrower path" for your active surfing and Internet use. So there you have it, 5 of the Best Internet speed test sites. If you're having issues with your Internet speeds, the first step is to test what performance you're getting. Also, we hope that you've found our tips on how to improve your speed helpful. Is your modem / router holding you back? The articles below might be of use! Internet Speed: How Does Your Country Rank?